My subconscious self is much busier than my admittedly very lazy conscious one. But when Subconscious Memsaab stirs Conscious Memsaab into action, watch out! I’d seen these decanters with little music box dancers in them in countless cabaret and drinking songs and when SM finally pinged me to say “You need to have one of these!” I was inspired by this reader to do an eBay search. Yesterday, my dream came true. All I need to do now is pour in some VAT 69 and I’m all set to pretend I’m Helen. It even works: the dancers twirl around as “How Dry I Am” plays sweetly. I will try to get my video camera to work (if I can find the battery *eyeroll*) so you can all share in the TRUE GLORY OF IT ALL. Posted on December 6, 2011 at 10:20 am in Hindi movies	| RSS feed You can skip to the end and leave a reply. TRIUMPH!!!!! A worthy addition to your already-amazing collection of treasures. Oh…. Seek and ye shall find. Awaiting the video now. See below (Baar Baar DIn Yeh Aaye)—that is exactly what it is like! BRILLIANT!!! Am IMPRESSED by Conscious Memsaab for having managed such a quick jugaad. :-) Congrats on your new acquisition! 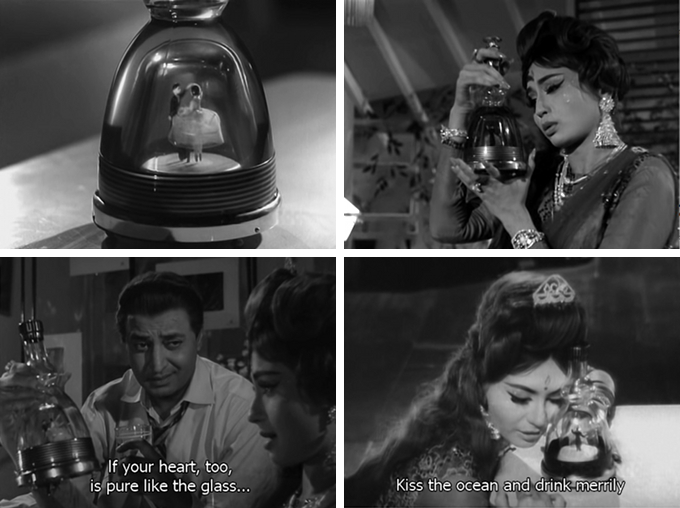 Btw, I even noticed this bottle at the very start of our favourite Bollywood birthday song “baar baar din ye aaye”. :-) Watch the first couple of seconds of this video. As usual I stand in awe of the minds that come up with awesome things like this…and of course of yours for noticing AND acquiring them! Bravo! OCD can come in handy sometimes ha ha. 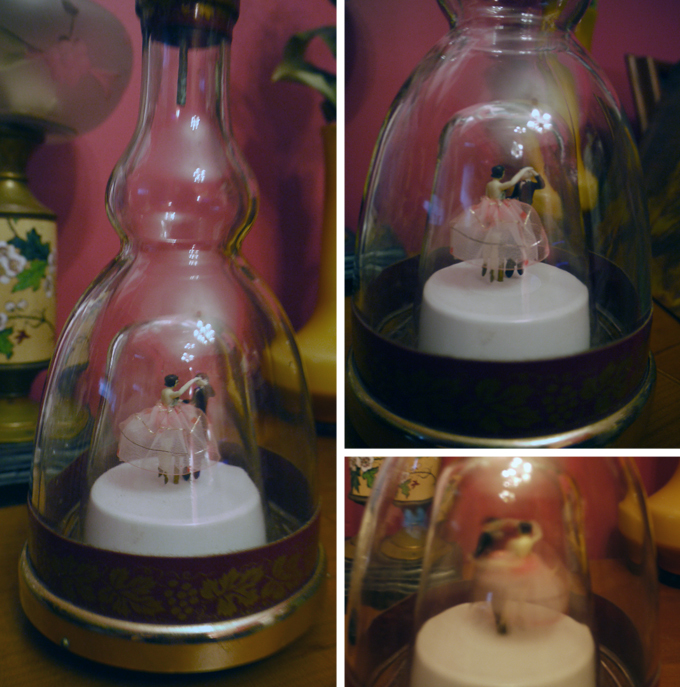 I discovered on my search that several distilleries seemed to put these music box dancers inside their bottles—there is one in particular that shows up a lot called “Bols”—but those are mostly liquor bottles not decanters, and have only one ballerina in them. So I was lucky indeed to find this one, which is much more the type I was looking for (a decanter with two dancers). Seems to have been quite the thing in the 60s though! I should start collecting all the songs where these appear now! Memsaab, observe me turning green and purple by turns (and sometimes even together). *I want* – I fell in love with this when I saw Bobby – and I thought it was the most romantic thing ever! Unfortunately, no boy has ever presented me with something like this! ps. If I ever visit you again, and then you find this (inexplicably) missing, I’d nothing to do with it. You too can find one, all you have to do is look and be patient! am glad that you found it! have a nice time with it! mybe you should open a bollywood nic-nacks museum. If you are waiting for that, then I see you passing your precious collection to the next generation and they to the next. But this way they will be secure! What next generation?! :( I don’t think the dogs will secure it very well. Will need to find an heir! So glad you managed to get one so soon after you made your wish. Pray tell, which corner of the world did you get it from? I saw one on the SA ebay but the music was different (iirc). An early christmas present to you from you, I think. It was right here in the good old US of A. Not sure where it originated though. There are more common ones with a single ballerina, which play “Blue Danube” (and as I said above are actual bottles of liquor, not decanters) but this is the one I’m familiar with in Hindi movies. Okaay! Invitation or not, I am coming to visit you – I have to see this acquisition of yours, so I can turn into a brighter shade of green than I am now! I just need an address! And, I forgot to mention this, if it disappears, I always have Anu to blame! Don’t look at me! Et tu, Lalitha? Then die, Anu! If it disappears I will come after BOTH of you and you will be sorry, oh yes you will. So you did get it! And very pretty it is too :-) The life lessons I learn from this lil’ blog of yours! In this instance, OCD always has to be acted upon. RK, here we come! All you wonderful bloggers have developed the wonderful art of jolting me out of my mournful status by stirring those beautiful memories through your posts. You see I wasn’t just mourning the loss of my mum but also my health and my doctor made it clear I have to learn to live with it (it is not something that modern medicine can cure) so I should stop mourning and be happy with what I have. And you bet I have plenty – mainly access to these wonderful blogs which take me back in time to those happy days of my childhood. I think that long introduction has tested your patience. You see I was pleasantly surprised to see that song featuring Sajid Khan and a rather sweet Yogita Bali (at least I find her sweet and pretty, do not know about anyone else). I had almost forgotten that Sajid had acted in a few Hindi films as the hero. Sajid who in his childhood acted in Mehboob Khan’s Mother India and Son of India was Mehboob Khan and Sardar Akhtar’s ( Mehboob Khan’s second wife) adopted son. He and my father together featured in the American TV serial ‘ Maya’ which was produced by King Brothers a division of MGM. Later Sajid grew up to be a pop star, he was quite popular in the west but what surprised us was he was also extremely popular in Japan; this was something my brother discovered while he was holidaying in Japan after finishing school along with his school friends. This was during the Expo ’70, as my brother and his friends moved around the pavilions at the Expo they were befriended by Japanese girls who wanted to know all about their idol Sajid Khan but then soon he disappeared from the scene and even from my memory until today when I logged on to this post. PS I am not always a Yogita fan, but agree with you that in this song she is very sweet indeed. Child actor Sajid Khan, born in Bombay, India on December 28, 1951 (some say 1952) got his start at age 6 in the movie “Mother India,” produced by Mehboob Khan, founder of Mehboob Studios, in India. Sajid is the adopted son of Mehboob. By the mid-1960s, Sajid moved to the United States. He starred in the 1966 movie “Maya,” which transitioned to TV the following year. Khan starred with Jay North in the Saturday-night, one-hour “small screen” version on NBC. It lasted less than five months. Competition from both CBS’ “Jackie Gleason Show” and ABC’s “Dating Game/Newlywed Game” combine probably didn’t help. Despite that setback, Khan was still considered a teen idol, and potential hot property, so Colgems Records – which was on its last legs with their best-known act, The Monkees, waning – signed Sajid to its label in 1968. Sajid’s only LP released featured songs that were mostly “retread Standards” from the pre-Rock era. Sajid DID have two minor hits from the LP, the first being “Getting To Know You” from Rodgers & Hammerstein’s “The King And I” (#108 in October 1968), and this song: a reworking of The Pied Pipers’ 1945 hit “Dream” (#119 pop charts, #29 Easy Listening charts, February 1969).The latter was written by the great Johnny Mercer. He reportedly is involved in a costume-jewelry factory in India. However, in the advent of the Internet’s popularity, there were several Sajid Khan dedication pages, and there’s even a sajidkhan.com website that has been under perpetual construction. So despite his short-lived success in the U.S., his legion of fans that are now on the Internet have never forgotten him. FYI: Consequently, there is/was ANOTHER Sajid Khan in the movie business, also born in India. He also directs, and was born in 1971. He is not related to the 1960s child actor here. After a massive search and find mission, Sajid sent an email response to Lora at the Yahoo fan site (http://clubs.yahoo.com/clubs/sajidkhan). Look for mesage 674. He keeps in touch with the group occasioanly. Well we can only hope he comes here one day! Thanks for the links and info, it’s so interesting. Personally I am never this observant to notice such small details like decanters with little music dancers in them, or rooms that seem to appear in many movies, so I envy Memsaab , Raja and others who are able to notice such fine details. If you come across any of them, do let me know Atul! I am trying to compile a list. These are the things one looks at when one a) doesn’t know what’s going on (no subtitles); b) is bored (poor direction/script/acting); c) has no attention span anyway (can’t focus on the bigger picture); d) has an overwhelming love for kitsch. @Memsaab – glad to know about your new acquisition. What’s next on your ‘I want now’ list? And I do second Atul on his remarks about your attention to detail. A truly vintage Air India Maharajah! (not a reproduction, I am a stickler for authenticity) :) Basically I need to be given free rein to pillage and plunder in old godowns on film studio lots! It has been a while since I saw a Maharajah. Now, only if it were Memsaab and Shammi and the song, “Aaja Aaja Main Hoon Pyaar Tera”. Oh my! It’s not a bottle or decanter, but it’s the same exact dancers, down to the red dots on her dress :D I’ll take Shah Rukh if I can’t have Shammi! +1 for persistence at tracking the damn thing :-). BTW, enjoy your new toy. Seems like it’s Christmas already in your household. > A truly vintage Air India Maharajah! Just wait awhile. They are going to re-introduce him back as a mascot in Air-India. The older ones still in circulation will fall in price (owing to not being antique anymore), or there will be newer tacky ones “Made in China” for cheap. The older ones will always have value as being antique—there is nothing like a true original! There are already newer tacky ones and reproductions being sold cheap, but I am picky! You are lucky the “want” gene is switched off, it’s kind of a burden sometimes. Not to mention occasionally expensive, although I try to control that. It’s really beautiful. A thing of sheer pleasure. So glad you have it, and shared it with all of us. Oh, that’s terribly, terribly sweet of you. I am sure she will treasure it forever. You can’t help but laugh as you use it. It’s lovely! What a thing indeed (and what a nice saying! ).